If you’re looking for a small one-of-a-kind rare species, look no further! Flame Thrower Palm trees are one of the most beautiful and exotic palm trees on planet earth. The botanical name of the Flame Thrower palm is “Chambeyronia Macrocarpa” and it originates from New Caledonia, a lush set of remote and prehistoric islands off the east coast of Australia. On this remote island, you will find extraordinary primitive plants dating back to the Mesozoic Era, when dinosaurs roamed our planet! The Flame Thrower Palm is considered a cold hardy palm and is known to survive temperatures down to 25 degrees F. The Flame Thrower Palm is a large, robust palm that develops pinnate-type broad arching leaflets that are deep shades of green with a leathery texture. As it matures and grows, the Flamethrower Palm will develop a swollen deep-green crownshaft with small white markings similar to a watermelon, which makes it very appealing as it sits above a beautifully ringed trunk that continues to grow. The Flame Thrower Palm is considered an easy palm to take care of. This palm will add a beautiful and exotic palm tree to your collection. These exotic and rare cold hardy palms thrive in well-draining soil in a moist climate and can adapt from low light to almost full sun. When the Flame Thrower receives too much sunlight, its shades of deep green turn to a light green. With the introduction of these beautiful palms throughout the world, they have earned several names, such as Blushing Palm, Watermelon Palm, and Red Feather Leaf Palm. 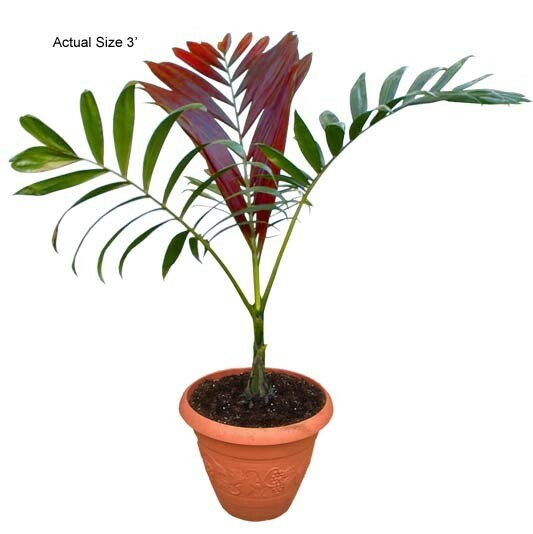 The Flame Thrower Palm Tree has overwhelmingly become one of the most preferred centerpiece palms in dynamic landscapes for its most amazing vibrant red leaf that it emerges from the palm heart. As this new leaf emerges, it becomes a focal point and conversation piece for years to come. This beautiful red leaf retains its brightness for around two weeks and then begins its amazing phase where it turns to a deep, leathery green color. For the Palmhugger, this is a must-have for your collection. It will also make a great addition to any indoor or outdoor landscape. The Initial growth period for the Flame Thrower Palm begins with large frond growth, as this new growth continues, a ring trunk will begin to form, followed by the elongated or bellied watermelon look to its lower crownshaft. As it matures, the Flamethrower has been known to grow upwards to 25 to 30 feet in its original habitat, which is a lush high altitude rainforest. Over the last couple of decades, the Flamethrower Palms cultivation typically leads to them growing to an average height of 15 to 20 feet, which takes decades itself. There are many unique palms and plants throughout the world, however, few grow such a vibrant red, feathery leaf. As is commonly known as, the Flame Thrower Palm is a piece of unspoiled nature which has survived millennia to help our planet produce more oxygen while reducing carbon monoxide in the air we breathe. That's why this piece of unspoiled nature, the Flame Thrower Palm tree, has our Palmhugger approval! Go Green! For assistance with Importing/Exporting pricing for your next project, please contact us at 888-RPT-AGRO (778-2476) or contact us via email at customer.service[at]realpalmtrees.com. Need plants and palm trees shipped via ocean freight for your project? No problem, just email logistics[at]realpalmtrees.com your plant list and they will help make it affordable, as the Logistics Team has provided global coverage of shipments at little to no cost for all fellow Palmhuggers. We all want to help the environment and go green to create our own paradise, and what better way than with beautiful Caribbean tropical plant foliage? For assistance with Large Quantity Orders (10+) or if you're thinking about designing your own personal palm paradise, let us provide you with the best layouts or proper placements for growing a beautiful tropical paradise for your family and friends. From Hawaiian Inspired back yards with custom bronze tiki torches, to creating a resort style paradise all your own, and even creating a formal Mediterranean inspired landscape adorned with cold hardy palms in terracotta planters, our Palmhuggers can help create your own paradise. They have created beautiful living and breathing landscapes that are both native-friendly and cost efficient. They also have experience with Showcase Specimen Palms for educational or personalized centerpieces for the palm lover and connoisseur. 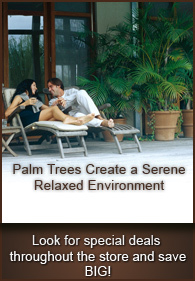 They can provide help or feedback to really bring life to your Palm Oasis! For Event Services, the Palm Squad is your lifeline, so let’s get started! Send your event details to customer[dot]service[at]realpalmtrees[dot]com and it will be routed to the Palm Squad. We have expedited services for rush situations, but in order to provide a friendly, cost effective and scheduled event, please provide them a minimum of 2 to 3 weeks prior to the event date, as they work in cooperation with both the locale and our Logistics Team. The Logistics Team is here to help save on the cost of shipping, by consolidating your event with others occurring in your locale, whether stateside or abroad. If your event is located in a large metropolitan city and/or you’re having a special ceremony or wedding, please provide at least 3 to 4 weeks. Please allot sufficient time for preparing and designing, but also sufficient time for event locale parking permits, dock scheduling, and properly unloading at the event site.